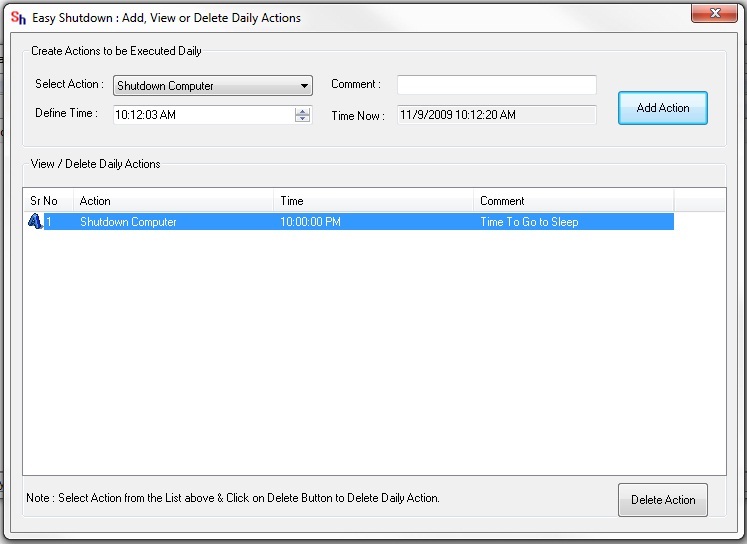 Auto Shut Down Computer Daily by Configuring Create Actions to be Executed Daily with Easy Shut Down Software Utility. Download & Install Easy Shut Down Software Utility. Launch Easy Shut Down Software from Desktop Shortcut. Go to File and Select Daily Actions. A window will appear Configure the Action in Select Action as Shut Down from the List. And then Configure the Time when to Auto Shut Down the Computer in the Define Time box. You can add Comment to that Action so that you don’t forget for what purpose you have added that Action. And press Add Action after Configuring all these Settings. After adding the action you can see the Added action in that window as displayed in the above Screen Shot. 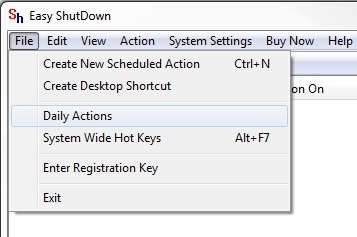 Your Computer will Shut Down Automatically Daily at the Configured time in the Easy Shut Down Software utility. You can also Delete the Added Daily Action by first Select the Action and press Delete Action on bottom of the Application, the Action will be deleted.